Singapore might only be a little red dot on the world map, but there is a myriad of captivating and romantic locations for pre-wedding photoshoots. In fact, with the right photographer, a little imagination and creativity as well as a gorgeous backdrop, the results of your shoot can be spectacular! If you need a little inspiration, then no worries! Because we have selected 7 romantic locations in Singapore for the best pre-wedding photoshoot. Learn more by reading on. If flora and fauna captivate you, then the Singapore Botanic Gardens will be a great place for a pre-wedding photoshoot. The 160-year-old tropical garden is a UNESCO World Heritage Site which makes the perfect backdrop for a nature-themed photoshoot in Singapore. There is a huge variety of gardens, flowers, and other horticultural attractions! We recommend heading to the Singapore Botanic Gardens during a weekday in the evening to capture soft light for an extra whimsical and fairy-tale vibe. A hidden gem located behind Hort Park, Canterburry Hill makes a superb pre-wedding photoshoot backdrop. With captivating greenery with no buildings in site, Canterburry Hill is like a secret garden with a unique ethereal vibe. The best time to head to Canterburry Hill would be during the evening or late afternoon to capture the mesmerizing sunset. Want a beach-themed wedding? Then look no further than East Coast Park for the perfect backdrop. East Coast Park might be one of the top family hangout spots in Singapore, but the greenery, beach and facilities make the area an ideal spot for a garden-themed pre-wedding photoshoot. Best of all, there is an abundant number of shady areas at East Coast Park so you won’t have to worry too much about time management. If you want a flowery indoor wonderland, then Gardens by the Bay is the prime option. A futuristic greenspace with several greenhouses and horticultural exhibitions, Gardens by the Bay is ideal for garden lovers. The Cloud Forest, in particular, has a lush 35-tall mountain and an indoor waterfall which make it a popular pre-wedding photoshoot spot in Singapore. If you want a more futuristic pre-wedding photoshoot with the key flora and fauna, make sure you go in the evening to catch the jawdropping light show! Giddy up because you can actually take your pre-wedding photoshoot with horses in Singapore! Horse City is a stable owned by Gallop Stable which offers a stunning racecourse as a backdrop. Great for horseback riders and animal lovers, Horse City is a must-visit for a unique pre-wedding photoshoot. Pssst… Did you know that you could also pose with friendly and cute horses and ponies? Get in touch with the staff at Gallop Stable if you want a photo with these furry friends. This should come to no surprise because there are various backdrops you could use in your pre-wedding photographs. Marina Barrage is excellent for a picnic-themed photoshoot with Marina Bay Sands, The Singapore Flyer and the Central Business District skyline as the backdrop. Whether you want a morning or evening shoot, Marina Barrage is a prime location for a pre-wedding photoshoot. The prime place for history lovers, the National Museum of Singapore boasts some magnificent architecture. Not only is it a popular spot for OOTD (outfit of the day) pictures, but it also an ideal location for a pre-wedding photoshoot. You can choose to shoot either indoors or outdoors. Just bear in mind that flash-photography in the exhibitions might be prohibited. Do all these gorgeous pictures and venue ideas inspire you? If you want to start planning for your pre-wedding photoshoot then you need to get in touch with a photographer, pronto! 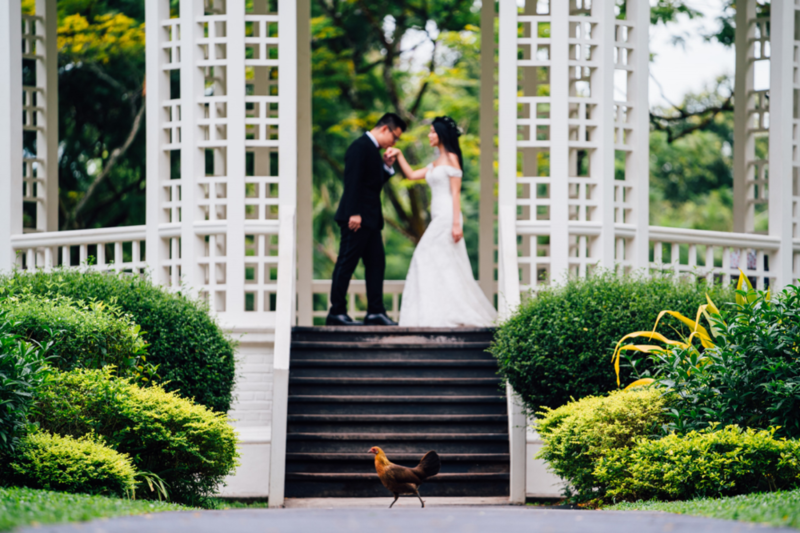 Luckily, the photographers at Chris Chang Photography are seasoned enough to capture the romantic moments between couples at various locations around Singapore. Click here to find out more about our services.